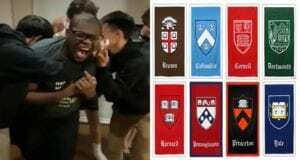 17-year-old Michael Brown is a happy man at the moment, as he reportedly got admitted into all 20 best universities in the United States he applied to. 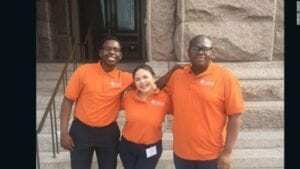 The Texas teen, who is currently a senior at Mirabeau B. Lamar High School, also got $260,000 in additional scholarship offers. “It’s something I’m proud of because I see my hard work paying off, determination paying off, sacrifices paying off” he said in an interview with CNN. Of the 20 schools he applied to, he listed his top eight choices as: Harvard, Princeton, Northwestern, Yale, University of Pennsylvania, Stanford, Georgetown and Vanderbilt. His proud mum, Rutledge-Brown lost three babies before becoming pregnant with Michael. Once she finally had a son, she poured all of her energy into giving him the very best that she possibly could. He only received one B during his entire academic career, which she said was very difficult for him.